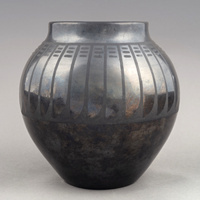 For a limited time, the CU Museum of Natural History will feature a special selection of blackware pottery created by internationally renowned ceramic artist Maria Martinez (1887-1980), known as Poveka in the Tewa language. This intimate assemblage of fine art pottery highlights examples of Martinez's distinctive black-on-black designs that evolved through her eight decades of pottery making at San Ildefonso Pueblo in New Mexico. Free exhibition. For more information and hours visit the CU Museum website.